The beaver, or more specifically, the trade in its valuable pelt, played a central role in the early exploration and settlement of Canada. However, the increasing demand for pelts eventually took its toll on beaver populations. The lands around Hudson and James Bays once teemed with beaver, but by 1930 overhunting and disease had reduced the population to near extinction. It was James Watt, post manager for the Hudson's Bay Cornpany at Rupert House, who developed the idea of the Beaver Preserve. When Aboriginal trappers located an occupied beaver lodge, Watt would pay them to allow the pair to breed. The First Nations also received a ration of staples to encourage them not to kill the beaver for food. Watt and his wife Maud eventually persuaded the Quebec government to establish a beaver sanctuary covering 7,200 square miles, under a lease with Mrs. Watt. No beavers could be trapped on the preserve until the population reached an acceptable level. The first quota of 450 beaver was trapped in 1940, and by 1944 there were 13,000 live animals. 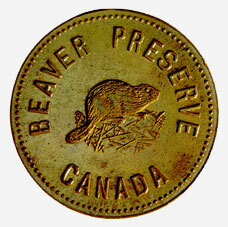 It is believed that the Beaver Preserve tokens were used to monitor the growth of the beaver population. The Indians received a numbered token for each beaver on their trapping lands and the head of each family was given a badge designating that person as a Beaver Warden. The tokens were first issued during thc 1930s and were struck in brass. Aluminum tokens also exist, probably struck during World War II when brass was restricted to use in the war effort. Beaver Preserve tokens are believed to have been in use until the early 1950s. The side not illustrated reads BEAVER TOKEN and below this, NO. with a stamped number. The token is approximately the size of a Canadian silver dollar but much thinner, and forms part of the National Currency Collection, Bank of Canada.